On the occasion of the hugely talented, innovative and original filmmaker George Romero receiving his star on Hollywood Boulevard (the auteur director died in July) and the wonderful tribute event we attended (screening Romero’s marvelous and underrated CREEPSHOW) this past week, we sense that Romero’s pioneering in the horror genre can’t have been easy. Although pic’s basic premise is repellent – recently dead bodies are resurrected and begin killing human beings in order to eat their flesh – it is in execution that the film distastefully excels.No brutalizing stone is left unturned: crowbars gash holes in the heads of the living dead, monsters are shown eating entrails, and – in a climax of unparalleled nausea – a little girl kills her mother by stabbing her a dozen times in the chest with a trowel. The rest of the pic is amateurism of the first order. Pittsburgh-based director George A. Romero appears incapable of contriving a single graceful set-up, and his cast is uniformly poor. Both Judith O’Dea and Duane Jones are sufficiently talented to warrant supporting roles in a backwoods community theatre, but Russell Streiner, Karl Hardman, Keith Wayne and Judith Ridley do not suggest that Pittsburgh is a haven for undiscovered thespians. John A. Russo’s screenplay is a model of verbal banality and suggests a total antipathy for his characters. In a related Romero happening, Jack Rutberg Fine Arts, the LaBrea Avenue art gallery, will present works by Romero and New York artist George Nama his friend and colleague. The exhibition,“LIBERATOR,” has subject matter inspired by the Jewish folk fable, Der Golem. 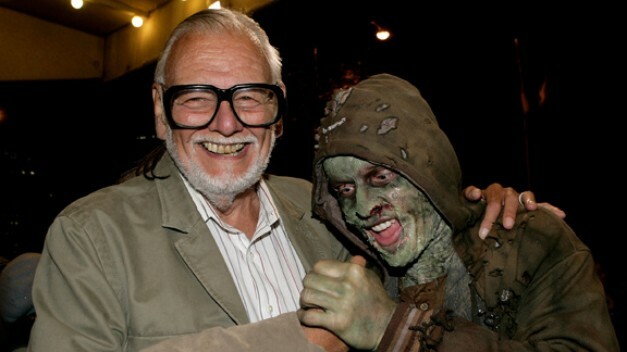 George A. Romero was so greatly looking forward to our exhibition opening last Saturday evening, following the dedication of his star on the Hollywood Walk of Fame. Sad that his passing in July prevented that, but the exhibition of his final collaborative endeavor – this time by writing a wonderful short story written for his life-long friend, George Nama is on full view with George Nama’s wonderful exhibition. We celebrate them both with our exhibition titled “Liberator” (the title of George Romero’s poignant story inspired by the ancient fable “the Golem”.